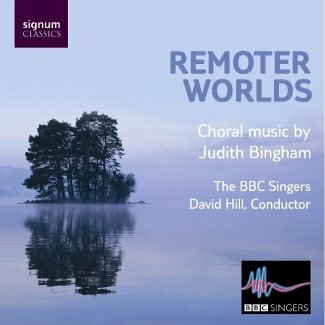 Judith Bingham is one of the many distinguished alumni of The BBC Singers and her collaboration with them over the past few years as associate composer was, in my opinion, an inspired choice and one which this recording clearly justifies. Following on from the success of her Mass for Westminster Cathedral Choir in 2003 and the Naxos recording of her choral works by Stephen Jackson and The BBC Symphony Chorus in 2007, this new disc by David Hill and The BBC Singers should firmly establish Judith Bingham as one of our leading choral composers; I hope it will encourage more choirs both amateur and professional to consider her works in their own programmes. Here Signum have produced another attractive and well-recorded album for which Bingham herself wrote the CD notes. These notes provide an excellent guide to this programme for which the opening work, 'Gleams of a Remoter World', provides the atmospheric title. Along with 'Water Lilies', 'Gleams' is one of the most touching and reflective pieces on the disc – 'Water Lilies' being the work that Bingham contributed to Linda McCartney's tribute album A Garland for Linda in 2000. These are deeply woven tapestries of memory, at once fond, melancholic and richly descriptive and Bingham herself explains how they both come from the same period in her life. The BBC singers take to these soundscapes with their trademark appetite for good music, and being equally at home across so many styles they seem unphased by Bingham's own refusal to be categorised into a particular style-bracket. The singers glide through her ravishing harmonies with an effortlessness that makes this music sound a lot easier than it really is. Of the other works on this disc, The Shepheardes Calender is, for me at least, the most enjoyable, even if it is rather dominated by the brilliance of its own second movement, 'Spring'. This is a setting of 'The Lord to me a Shepherd is' from the Bay Psalm Book that quickly establishes itself as an Ohrwurm with a maddeningly fascinating collage of humming and singing. The BBC singers are at their very best here, clearly enjoying the mesmeric chord patterns which are an unsettling accompaniment to the shimmering spread of harmonies from the upper voices. There are moments of ravishing beauty from the sopranos where their phrases end by fanning out into chords. Listen out for the climactic word-painting when their cup overflows; this is really wonderful writing and beautifully executed by The BBC Singers. Bingham's music is not always an easy listen though: there are also bleak landscapes here especially in the Irish Tenebrae which can be quite demanding at times, and she does not flinch from leading us to these darker places. Olivia Robinson's rich voice is well matched to these poems and her performances here are quite wonderful. There are times, however, when the choir makes phrases feel slightly more laborious than I'm sure they ought to be. The BBC singers are quite big-voiced and whilst I welcome the opportunity to hear larger voices in a choral context I notice that their notion of blend can sometimes become lost amongst so much vocal individuality. This boils down to that awkward vibrato question again and I am loath even to mention it but there are moments when vibrato is the elephant-in-the-room and not just because the singers use so much vibrato, but rather because they all have such individual vibrato. However, when one hears the high quality of the solo singing (and whistling!) throughout this disc it does go a long way to explain why this individuality is so prominent and maybe it is just a question of us as listeners needing to reconnect with a larger choral sound amidst the prevailing dominance of current early music ensembles. These are, of course, mere questions of personal taste and should not deter anyone from being inspired by this selection of choral music. The BBC Singers and Judith Bingham are a wonderful collaboration and this new album is not to be missed.